Jon Scheyer has proven himself to be a versatile player at Duke. He has the ability to score, rebound, defend, and run the offense. Prior to his arrival in Durham, the 6-5 180 pound shooting guard became infamous by scoring 21 points in 75 seconds as a senior on Glenbrook North HS basketball team. 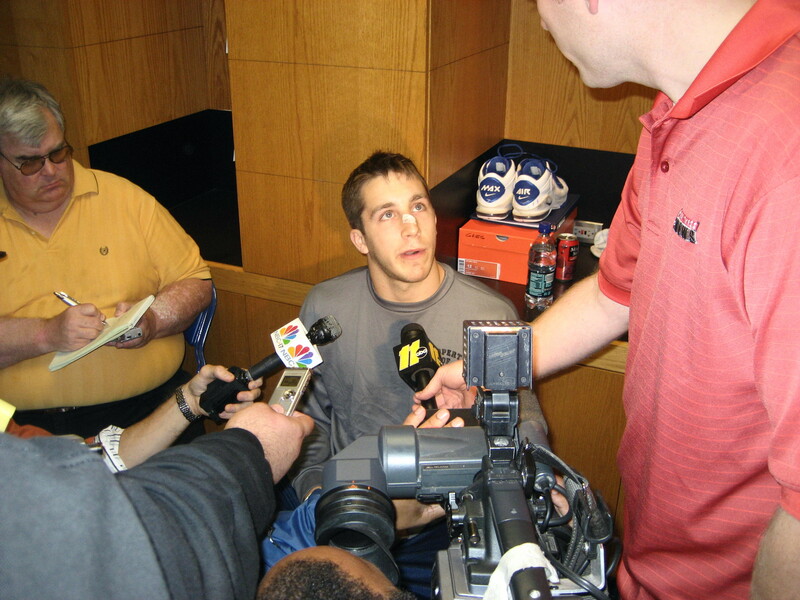 Ranked as the twentieth best player in the Class of 2006, and the number three shooting guard, Blue Devil fans much anticipated Scheyer’s arrival in Durham. Over the course of his first two seasons, Scheyer has lived up to the hype by averaging 11.9 points in 31 minutes per game. He has also dished out 2.1 assist per game and served as the back-up point guard. Duke’s offense efficiently flows with Scheyer operating as the primary ball handler. He has the best assists to turnover ratio on the team. An added benefit of Scheyer handling the ball, especially late in the game, is his 86.7 percent career free throw percentage. Scheyer has averaged 3.6 rebounds per game with a single game high of 12 in the overtime loss to Pittsburgh last December. His strength is having the versatility to accomplish what is needed within the flow of the game. As a freshman, Scheyer started 32 games, but last season Coach Krzyzewski moved Scheyer into the sixth man role. Coming off the bench, Scheyer played the third most minutes, behind DeMarcus Nelson and Kyle Singler, and was the team’s fourth leading scorer. 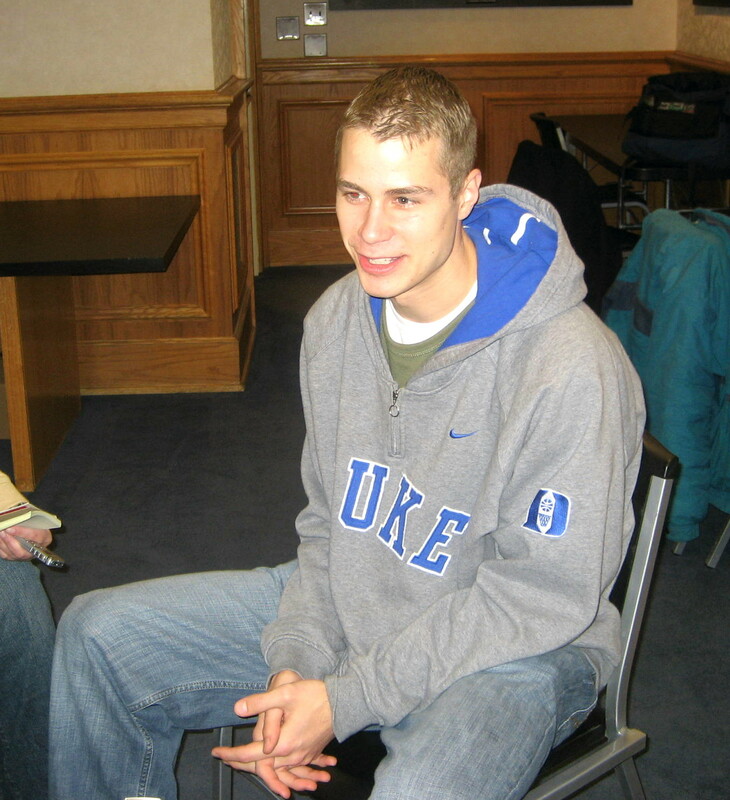 The move from starter to sixth man did not affect Scheyer’s productivity. Jon Scheyer’s performance during his junior season will be key to the success of the Blue Devils. He is now a very experienced upperclassman and with leading scorer DeMarcus Nelson lost to graduation, Duke will look toward Scheyer to be one of the players having the ball in his hands more often and taking additional shots. Being effective with those extra possessions is a must for the upperclassman. Scheyer does not need to score 21 points in 75 seconds, he just needs to continue being consistent and versatile. Greg Paulus has the heart of a champion! Greg Paulus arrived at Duke, from Christian Brothers Academy in Syracuse, NY, as the # 1 ranked point guard in the Class of 2005. His career at Duke has been a roller coaster ride of ups and downs. As a freshman, he led the ACC in assists with 187 and was named to the All-ACC Freshmen Team. However, on October 14, 2006, in Duke's second official practice of Paulus' sophomore season, he broke his left foot and was hobbled for his entire second season in Durham. As a junior, Paulus rebounded with a solid season earning 3rd Team All-ACC honors and solidified his reputation as a deadly long range shooter. For the season, Paulus made 42.3 % of his field goal attempts from behind the 3-point arc. Coach Mike Krzyzewski, during his annual summer press conference, on June 17th, stated that Paulus had been out two and a half months rehabilitating a sore knee so it is evident that Greg wasn't 100 percent healthy during his junior season. The arrival of Paulus' senior season finds Duke in good shape. Coach Krzyzewski stated this year's team has the most talent he has had for the past four years. Duke returns eight scholarship players from last season's 28-6 squad; three new recruits have arrived including McDonald's All-American Elliot Williams; and 6-5 shooting guard Martynas Pocius returns after a medical redshirt. Paulus is a gritty competitor and Duke needs him to provide on court leadership in his senior season. This year’s squad is very experienced when compared to the last two seasons, but Paulus needs to aggressively pursue a leadership role and be the glue guy that holds all the talent together. Paulus has proven how tough he is by playing hurt…he has proven how talented he is by knocking down shots from deep behind the bonus line…he has proven how big of a heart he has by diving across the floor in pursuit of loose balls. His legacy at Duke could be established this season when he proves how great of a leader he is by holding together this year’s talented group of Blue Devils. Success for Greg Paulus will not be measured by individual accomplishments and accolades, but by whether Duke is still playing in April. There are many fans who just insist that the sky is falling with Duke recruiting. Well, they should be singing a happy tune now for Duke received a commitment from Atlantic Shores star, Andre Dawkins on Thursday evening. Dawkins was fresh off a visit on Monday and could hardly wait to make his decision after being blown away by his visit and an offer. 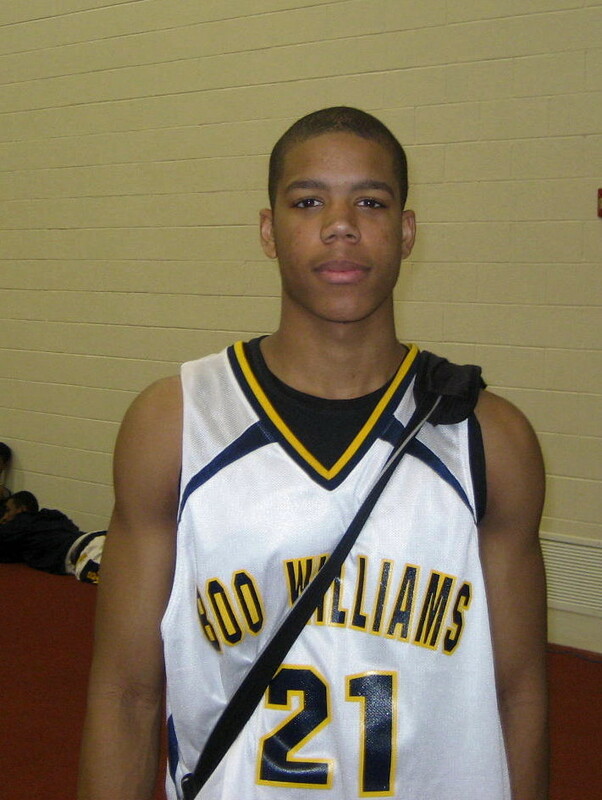 Dawkins was the conference POY as a sophomore in a tough Tidewater league. Duke was Dawkins' dream school growing up and for what it's worth, he is friends with Josh Hairston, playing one season of AAU ball with him. Dawkins is a 6-4 shooting guard with a sweet stroke, good handle and a lot of upside. We hinted that Dawkins was a virtual lock earlier tonight on the premium message board. Shortly after that, he called the coaches who are in Las Vegas with the good news. I am dropping some more hints as to the next commitment to members of BDN Premium. Dawkins plays for Boo Williams Senior team, the only underclassman on one of AAU's best squads. He is the first player to sign with the Blue Devils for the class of 2010. While Duke lost McDonald, they gained Dawkins and it was a dream come true for a great young man who has quite a bit of talent on the hardwood. Factoids - Metro Conference Player of the Year. First Metro Conference player to make All-Tidewater since 1998. Averaged 22.4 points, 5.6 rebounds and shot 42 percent from 3-point range. 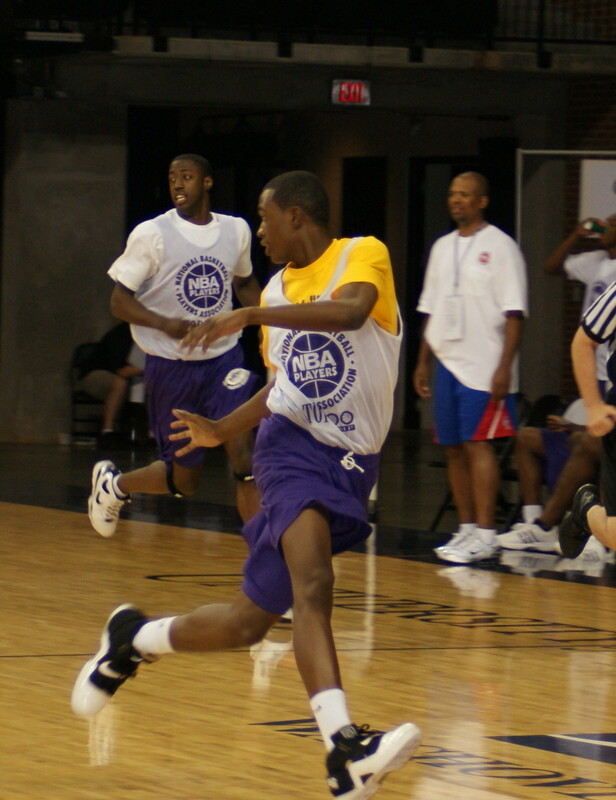 Doron Lamb is not super athletic like Boynton, but he is long and lean and oh does he have a way of getting it done. During the NBAPA, he could draw fouls at will and was deadly from the stripe. He slashes well and isn't afraid to battle bigger guys. He has good on ball defensive skills and plays the passing lanes well, not to mention switching off with precision. In short, he is a player that has a nice package to bring to the table. Doron Lamb! How old are you? If somebody had never seen your game, how would you describe it to them? I'm a hard worker who gets back on defense and loves to play it. Defense is my thing. Get my teammates involved and score when I have to. I like playing with good players, They're All Americans and it makes me better. Who is the toughest player you have gone up against thus far? Where are you in the process right now? Are you getting serious yet? I'm not worried about college right now. I have two more years of high school. I am hearing from a lot of schools though. Syracuse, Georgetown, Kansas, Duke, North Carolina are some. They have a good coach and I like their style. Duke? I mean they're one of the best teams in the country. Coach K is one of the best coaches. What factors will eventually go into your decision. What will play a role in the ultimate choice? I want to play for a team that runs up and down the court. I'm not afraid to take it down low. Where will you be the rest of the AAU summer? We are going to Peach Jam in a few weeks and then Orlando and then the showcase. What are your aspirations for the coming high school season? To win the state. We went to the final four last year and it was not enough for me. I want to win the state. Hard worker, coachable and dependable. How do you like the camp? It's a good camp. They teach you how to handle yourself on and off the court. You are one of a handful of underclassmen here. Is that an honor? Yes, it's an honor to be invited to top flight camp. It's mice to make new friends with a lot of people. So, it's do or die against the unbeaten Lakers ... are you going to do it? Yeah, we're going to win. I am ready to play some defense. One more question, what is your actual height and weight? I'm 6-3, 170, but I am pushing 6-4. Josh Hairston rose to the top of the Blue Devils list of players from the class of 2010 at breakneck speed. The Blue Devils were impressed with what they saw from Josh after taking in several AAU events. During this past weekend's NBAPA Camp, Josh informed me of his visit and I later learned from a solid source that he would be offered a scholarship. [private]When I caught up to Josh, he was obviously tired. Afterall, he had played in Charlottesville and taken the Duke visit after one days rest. Josh was polite and definitely livened up as our conversation went on. Here is the very latest on Josh Hairston. We talked at the NBAPA Camp and you informed me of your visit to Duke on Tuesday. I am following up on our previous conversation and would like to know your thoughts on the visit. It was great. Coach K is a great guy. He's got a great staff and it was an experience. Were you able to shoot around in Cameron or the new practice facility? No, I just went for the visit, but Kenny Boynton was down there too and he was playing a bit. They asked me if I wanted to play though. We got down there kind of late. So, you went with your family... or your team? Yes sir. I went with my Mom and my Dad and high school coach. Was this your first visit to Duke? We had actually been down there for the Bob Gibbons TOC, but we really didn't get a chance to walk around. This was the first time we got to tour the campus and were able to look around at most of it. So, did you like what you were able to see? Definitely. I had a great time walking around and just seeing everything ... and Duke is a beautiful place. Any talks on the visit? Yes sir. Coach K said they didn't lock down people to just one position because they would think this is all they have to learn and not develop their skills. They see me being able to play, almost where Kyle Singler plays. If I get a big guy on me, I could go out to the wing and if I had a smaller guy on me I could post them up. Did anything stand out on the visit? They just built a new practice facility and it was beautiful. It was real nice. It has a new weight room and everything. We saw where the new locker rooms are going to be. When it's all done it should be real nice. Did Duke offer you while there? Yes. That makes ten offers. How many of those offers are you kind of serious about? And what schools are they? Ohio State, Virginia Tech, Duke and Virginia. How did your parents like the visit? Oh man! My parents had a great time. My Mom really enjoyed it ... my Dad did too. I just remembered when Coach K walked into the practice facility, all of us almost passed out. I mean, he's a real good guy. Dad was the first one to go talk to Coach K. He came over and my dad ... the first thing he said to Coach K is that he was a legend. My Dad and Coach K kind of had a little connection going because they were talking a whole lot. Coach K complemented me .. us, saying we were a good family and stuff like that. I think you told me in an earlier interview that you would make a decision in the Fall. Does that still hold true? I don't think so. Not now. With the new offers coming in ... I think that I am going to wait it out until the start of high school season and I may make that decision later. So, you will entertain more offers? No, I'm ready to shut it off now. I would say thanks, but no thanks. I may make two or three more visits. I would listen to North Carolina because I grew up a fan. Were you surprised Duke offered? I was. Coach K said they don't recruit everybody. My high school coach let me know that they usually don't offer until your senior season and stuff like that. I may be the youngest they have ever offered ... I didn't think they would offer me like that. Coach K made it clear that they really liked me, and really wanted me and wanted me to play there. I could see myself playing there. I actually missed Andre Dawkins who was there the day before. Kenny was there, but I didn't get any one on one time with him. I did talk with him at the NBAPA Camp and he feels strongly about Duke as well. Dawkins is from your area, right? I actually played with Andre my freshman year with Boo Williams. We are very close and stay in touch. He's one of those kids who actually grew up a Duke fan all his life. Thank you for your time and good luck with the process. - in the latest addition of our infamous General Update, we clued members in to Dawkins offer and ones to come. 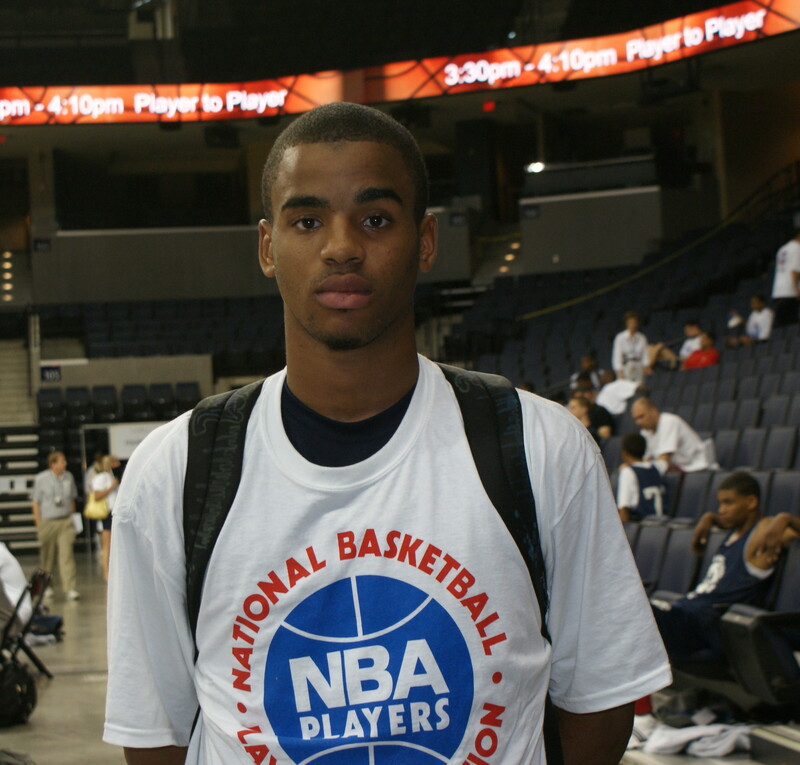 - an interview with Josh Hairston from the NBAPA before his trip to Durham, which whetted the appetites of our members. - then we put up an exclusive one on one with 09 prospect Jamil Wilson. 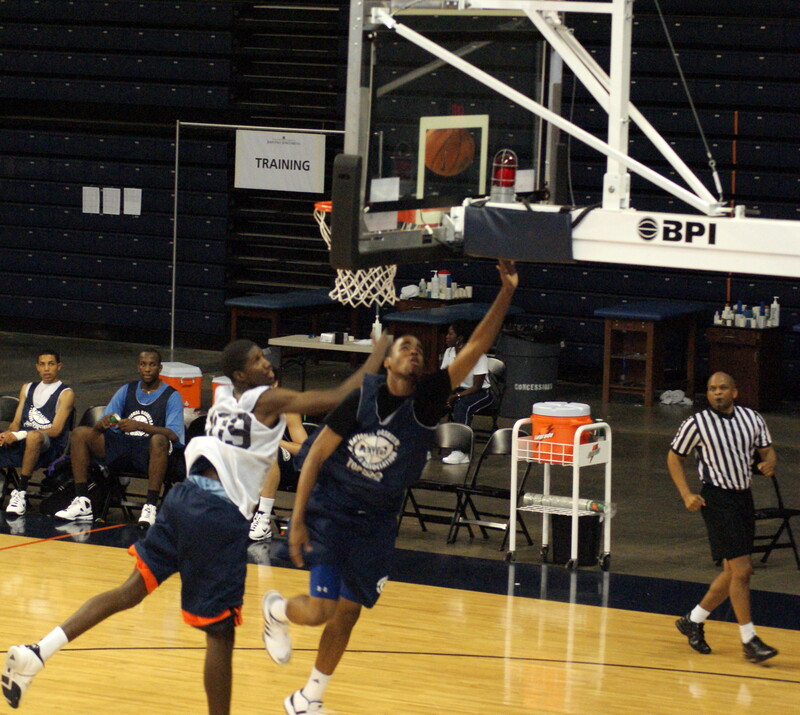 Again, from the NBAPA Top 100 Camp. - we followed that with another exclusive with 09's Terrell Vinson who was named the best all around player at the event. - then we got some great comments from big Nate Lubick, a star on the rise. - we reported from the NBAPA, as it happened, even cluing people in that Kenny Boynton would be named the MVP before the tip off of the championship game. - add a follow up interview with Josh Hairston last evening. He had some really nice things to say about his Duke visit. Oh, and there is more to come. We already have interviews with the following prospects on tap. We'll start with Kenny Boynton Jr. Then there is Brandon Knight and ... well, we will have to keep the other names on the inside for now, for the competition will surely try and make that information their own. I can tell you that there are five more interviews with Duke prospects which we will be churning out over the next few days. So, come on in and join Blue Devil Nation Premium!